What do you do to brighten up a winter's day when all your friends are busy? 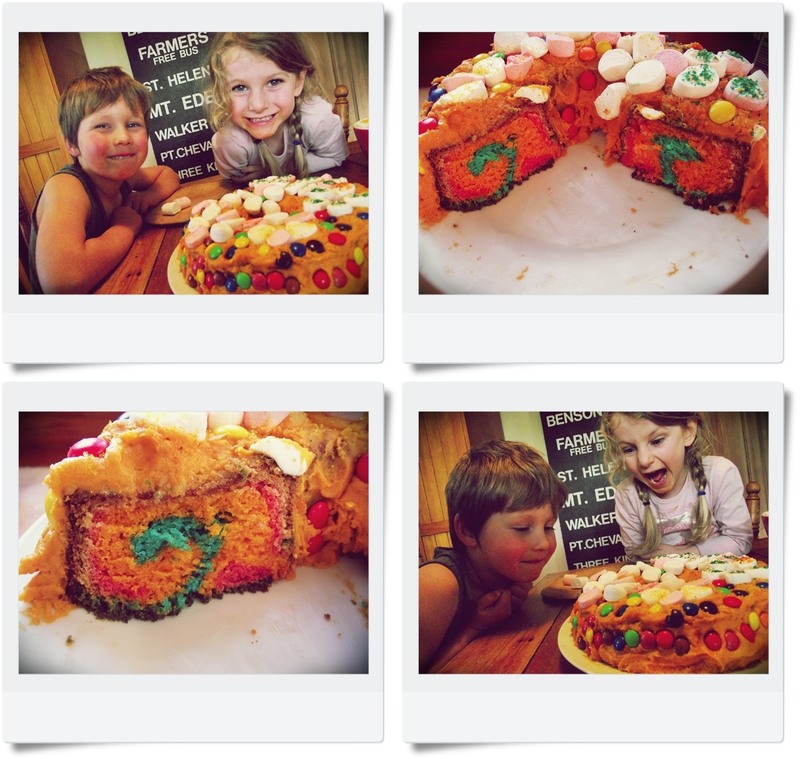 Why, you bake a bright cake of course! 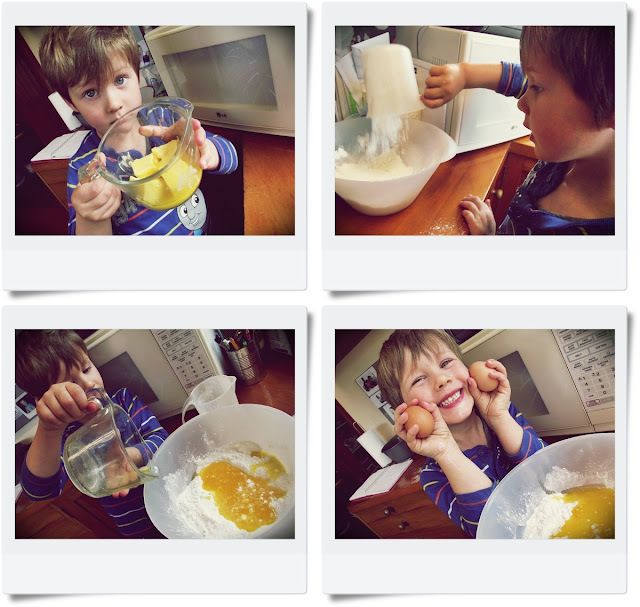 Scrag loves to bake, so when we couldn't find a friend to play with on a rainy Friday morning, the suggestion of baking and decorating a cake turned his frown upside down. 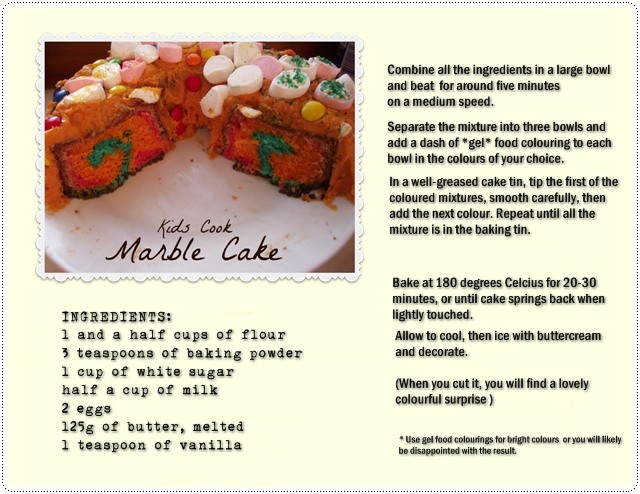 I decided to use Meredy's Rainbow Cake recipe - because it's so simple - but instead of baking separate layers, we would turn our rainbow into a marble cake instead. Plonk all the ingredients into the bowl and then beat together for around five minutes on medium speed (I have a simple electric hand beater and it does the job just fine). 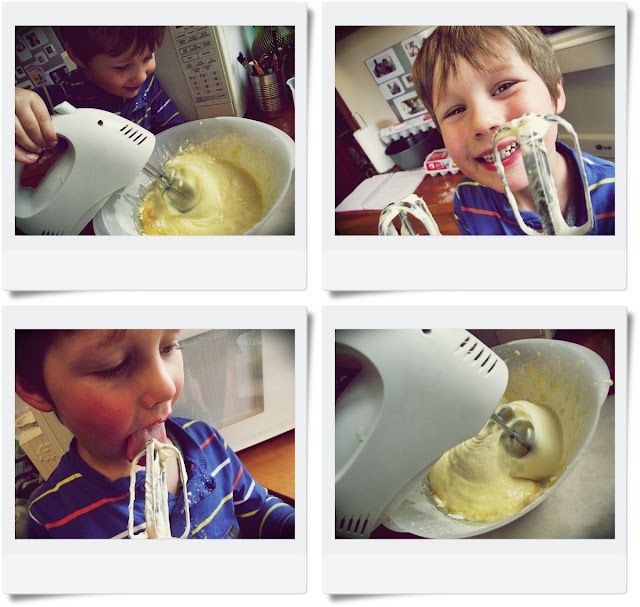 Don't forget to lick the beater! Separate the mixture into three bowls. Let your little helper choose his favourite colours - Scrag chose Red, Orange and Green: "Traffic light colours, mum!" 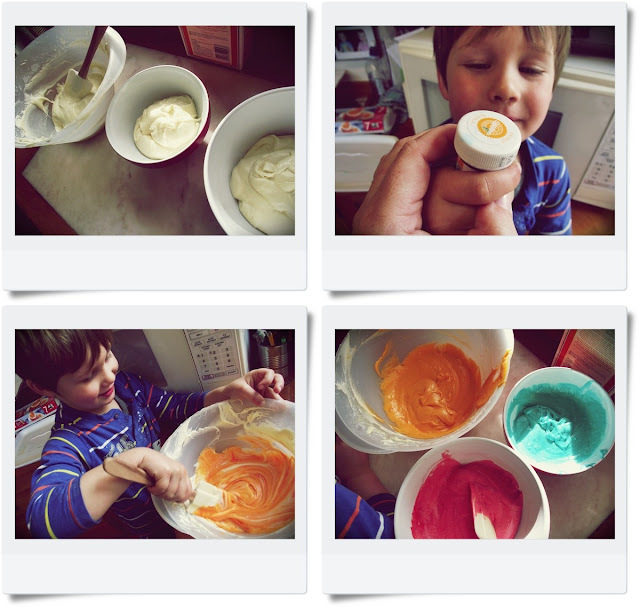 Add a smidge of gel food colouring to each bowl and mix well. Use gel food colourings to get bright colours or you will likely be disappointed with the result. They are worth investing in, as they last for ages. Only a tiny bit is needed for lovely bright colours. 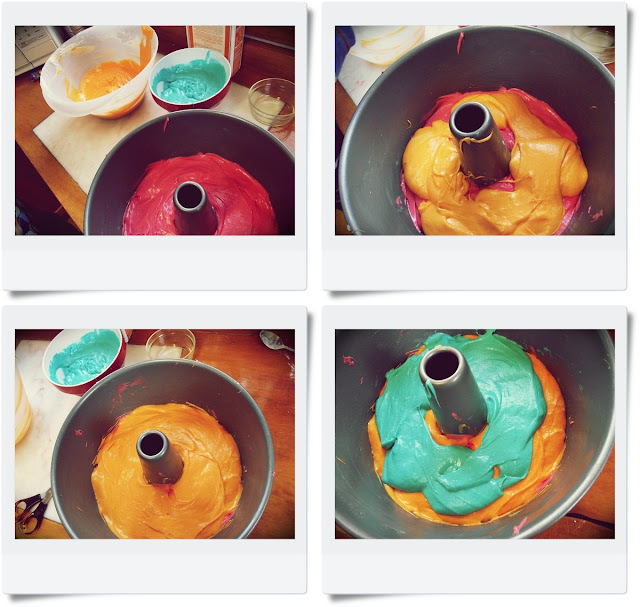 Repeat the process until all the mixture is in the baking tin. 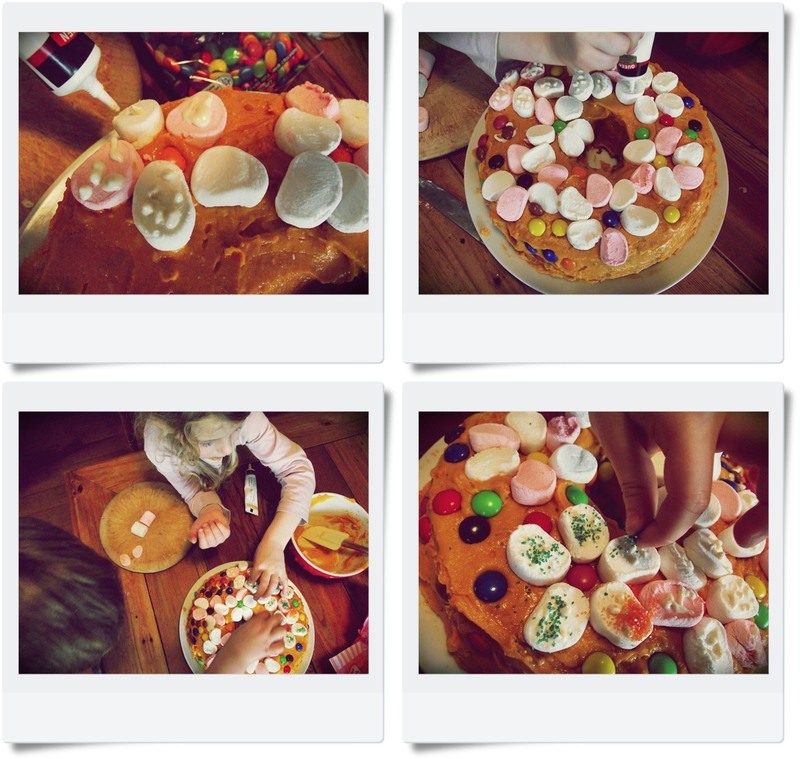 We used a ring-cake tin, so it wasn't necessary to do anything else. 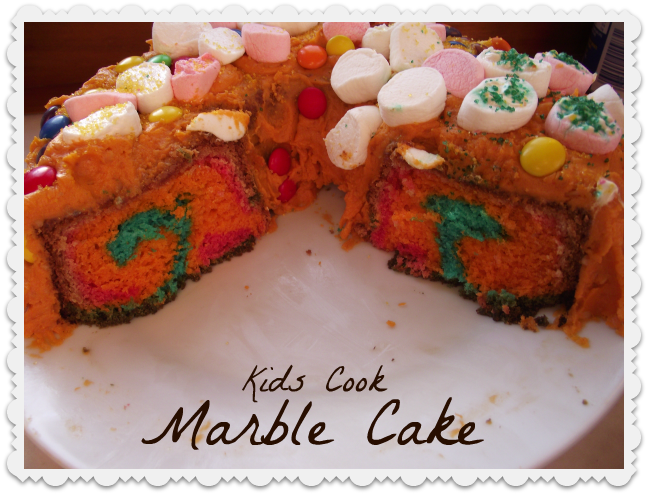 If you are using a regular round cake tin, perhaps stir the mixture with a skewer in a few places for a swirly marble look once baked. Bake at 180 degrees Celcius for 20-30 minutes, or until cake springs back when lightly touched. Allow to cool completely before decorating. a friend to help with the decorating! Scrag decided on peanut buttercream icing, and as it was my first attempt at that flavour, I may have overdone it slightly on the peanut butter. Originally he asked for yellow icing, but well, er, when added we yellow to the brownish buttercream... it sadly resembled something rather.... pooey. So we made it orange instead. Slightly garish, but since orange is Scrag's favourite colour, he was not complaining. Our young cake decorators had a lovely time making the very bright cake beautiful. They were mighty pleased with the result. And look how cool the cake turned out when we cut it? It has a swirl of green... completely unplanned and totally random. O Happy Accident! Ah yes, baking a bright cake is a fab way to brighten up a winter's day. We are planning another cake-bake this Friday, and are inviting some friends to come join us to celebrate the end of the School Term. Who says Winter has to be dull and dreary?